In a large pan, heat oil and saute onion & garlic. Add beans, chicken or turkey, broth, corn, chiles, cumin salt and pepper. Bring to a boil. Reduce heat and simmer 30 minutes, uncovered. Remove from heat and stir in sour cream and whipping cream. Garnish with parsley. Serves 6-8. Delicious! Kristy served this delicious soup at our Adrians Christmas Party…so yummy! 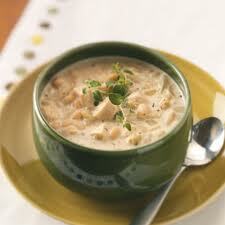 She prepared it in a Crock Pot and let simmer on low…adding the sour cream and heavy cream just before serving. Yum! Thank you for sharing Kristy! PS…This would be a great way to use your leftover Thanksgiving or Christmas Turkey!